The Jamie Lloyd Company's season of one act Pinter plays continues, an awe-inspiring series that delights audiences at the Harold Pinter theatre. 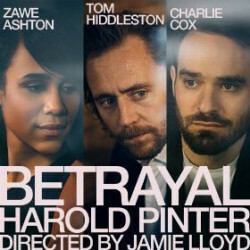 Welcome to Betrayal, a dazzlingly clever exploration of one-upmanship, face saving, dishonesty, and self deception. What a play, what a theatre, and what a star... in the shape of the brilliant Tom Hiddleston. Magnificent from the outside with its ornate pale frontage and wreath motifs, The Harold Pinter theatre’s splendid interior, dating back to 1881, is one London’s oldest and loveliest. You’ll enjoy a wealth of original features despite the theatre being unsympathetically restored in 1954. Its Renaissance-style wood panels, beautiful gold ceiling, golden wallpaper and original brass ceiling sun-burner make for a traditional theatre experience to remember. 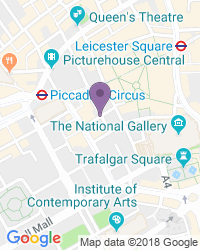 The Harold Pinter Theatre was originally called The Royal Comedy Theatre, becoming the Harold Pinter in 2011. First opening its doors way back in 1881, it was designed by Thomas Verity and built incredibly quickly, taking just six months. In the middle of the 1950s it was refurbished, re-opening in 1955. Thankfully they left the auditorium alone and today it’s still an exercise in 1880s splendour, with its gorgeous three tiered horseshoe balconies. The famous operetta Falka premiered in 1883, and Erminie premiered in 1885. Charles Blake Cochran and André Charlot presented their famous revues throughout the First World War, which made the theatre’s name as a must-visit destination. The theatre’s orchestra pit is original, dating back to 1881, but these days it’s rarely used. The last time was in 2009, the first time an orchestra had played from the pit in a quarter of a century. In 1956 the theatre played a starring role in overturning the outdated stage censorship set in place by the 1843 Theatres Act, which was finally repealed in 1968. Setting up the New Watergate Club under producer Anthony Field meant they could legally stage plays that had been banned because of bad language or frowned-upon story lines. Without their actions Arthur Miller's A View from the Bridge, Robert Anderson's Tea and Sympathy and Tennessee Williams' Cat on a Hot Tin Roof might never have been staged in the West End. Today the Harold Pinter Theatre is part of the Ambassador Theatre Group. This historic venue has seen countless smash hits, wowing theatre audiences with Journey's End, The Old Masters and Whose Life is it Anyway? Audiences have raised the rafters for shows like The Home Place, The Caesar Twins, Steptoe and Son, Donkeys' Years and classic good-time audience participation show The Rocky Horror Show, which had its debut at the Harold Pinter in 1979. Stockard Channing appeared in Six Degrees of Separation, which won best play at the 1993 Olivier Awards, and Maureen Lipman starred in Peggy For You. The theatre’s biggest hits, however, were the 2000 performance of The Caretaker, with Michael Gambon, plus a remarkable eight week sell out of Little Malcolm and his Struggle Against the Eunuchs in 1999, starring Ewan McGregor. The Box Office and foyer are at street level, and the easiest access is to the Dress Circle, which provides four wheelchair spaces or space for small scooters. We’re your number one destination for a wide variety of seat types and prices, with excellent availability on the full range of Harold Pinter Theatre tickets.